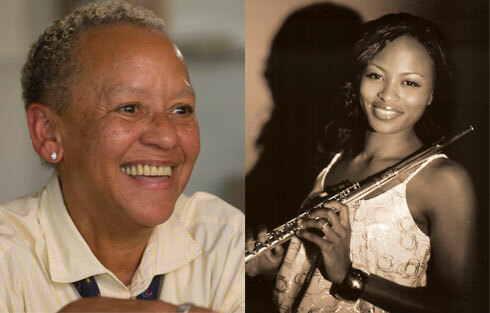 BLACKSBURG, Va., Oct. 8, 2008 – The Lonnie Davis Quintet, featuring flute player Lonnie Davis, and Nikki Giovanni, University Distinguished Professor of English at Virginia Tech, will be featured at a Renaissance Gala at the Inn at Virginia Tech on Saturday, Oct. 25. Principal sponsors will be Christiansburg Institute Inc. (CII) and Virginia Tech's Office for Equity and Inclusion. The semi-formal event, a fund-raiser for CII, which is revitalizing the 100-year-old Christiansburg Institute (CI), will begin with a reception at 6 p.m. in the foyer of the Latham Ballroom before moving into the ballroom for dinner and dancing. CI served as the black high school throughout the region, beginning after the Civil War and operating into the 1960s. “In a continuing effort to build university/community relations, the Office for Equity and Inclusion is co-sponsoring the Renaissance Gala with the Christiansburg Institute Inc. because we recognize the historic significance of CI to our institution and our community, and we want to do everything that we possibly can to help them preserve their conceptual pillars of community building, education, preservation, and exhibition,” said Kevin McDonald, Virginia Tech’s vice president for equity and inclusion. The band will be comprised of Lonnie Davis on flute; Ocie Davis, drums; James Miley, piano; Robert McCollough, bass; and Cyrus Pace, guitar. Bandleader Lonnie Davis, a noted musician in New Orleans and Charlotte, N.C., comes from a long line of musicians, including Preservation Hall trumpeter Kid “Sheik” Colar and pianist Fats Domino. Classically trained on the violin as a child, she studied music at the New Orleans Center for the Creative Arts and the University of New Orleans. Miley, an assistant professor of jazz studies at Virginia Tech, studied at the University of Oregon, the University of Arizona, and Occidental College. He directs the Virginia Tech Jazz Ensemble and jazz combos and is the recipient of the 2004 International Association for Jazz Education’s Gil Evans Fellowship in Jazz Composition. McCollough holds an undergraduate degree in music from Radford University and is currently studying with noted jazz bassist John Patitucci. He performs in New York City and along the East Coast. Pace, who played his first professional gig at the age of 15, has toured extensively with the Navy Band. A guest lecturer at Roanoke College and founder of a new music school, Valley Academy of Music, in Roanoke, Va., he holds a master’s degree in performance from Manhattan School of Music. The quintet will play a wide range of music, from popular to blues and jazz. Giovanni, a nationally noted poet and speaker, will give a presentation during the dinner. She has won numerous awards for her work, including several NAACP Image Awards, the first Rosa Parks Women of Courage Award, and the Carl Sandburg Literary Award, and her work has made the New York Times Best-Seller List. According to Elaine Carter, executive director of CII, the organization hopes to find additional sponsors for the gala. Businesses, organizations, and individuals who want to help should call CII at 394-5001 or send an e-mail message to christiansburginstitute@ci-2.org. Tickets for the event are available through the University Unions and Student Activities Ticket Office and cost $50 per person.